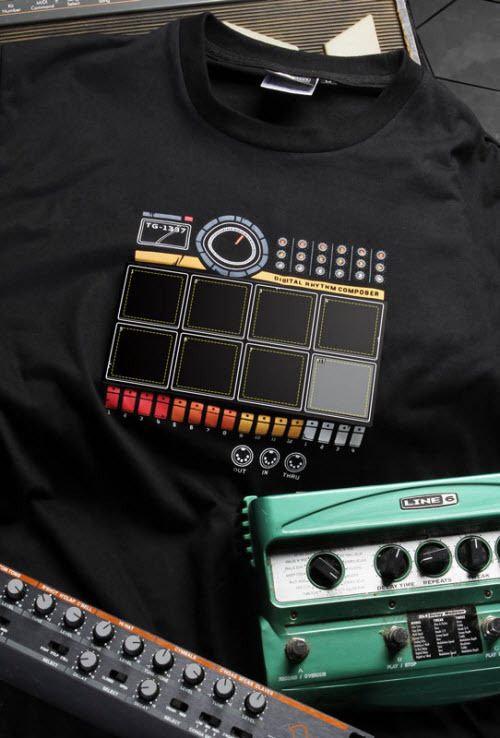 ThinkGeek Has A Drum Machine T-Shirt | OhGizmo! It’s a fully functional drum set in a T-Shirt, which comes with its own powered mini amplifier that clips to your belt and “goes up to 11.” Better yet, there’s a looping functionality with unlimited tracks and loops that can last up to 3 minutes. With 9 synthesized sounds like “Rock drums”, “Discotek” and “Scratchy”, you’ll be tapping your chest like a lunatic while laying down some rhymes in no time. Don’t believe us, check out the below video. The shirt is washable as the electronics are removable and the best part is the price: $29. It’s currently out of stock but will be ready to ship on the 10th. That’s tomorrow, folks. I bet it’s a hit with the chicks..